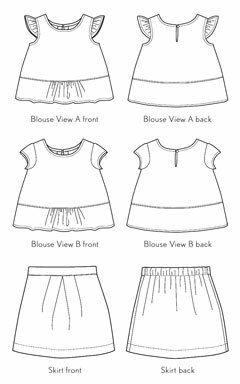 Sew this blouse with either a ruffled sleeve or a cap sleeve. The blouse features a back keyhole opening with button closure and a subtle peplum with gathers at the front. The skirt is a simple pull-on A-line skirt with front pleats and an elasticised back waist.